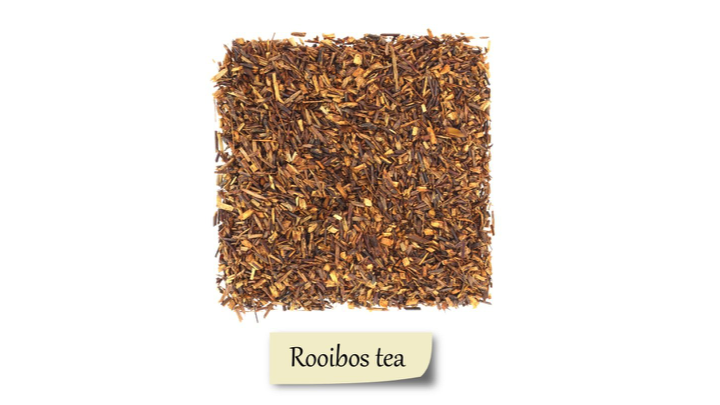 Rooibos, meaning "red bush, or Aspalathus linearis is a plant grown in South Africa’s natural shrubland mainly in winter rainfall coastal and mountainous areas with a Mediterranean climate. People often use the leaves to make an herbal tea. The herb’s soothing effects make rooibos a perfect drink. Rooibos, meaning "red bush" or Aspalathus linearis, is a plant grown in South Africa’s natural shrubland mainly in winter rainfall coastal and mountainous areas with a Mediterranean climate. People often use the leaves to make an herbal tea. The herb’s soothing effects make rooibos a perfect drink. Here are 7 health benefits of rooibos. 1. Rooibos is a great drink for individuals with kidney stones. Because rooibos does not contain the crystal-forming substance, oxalic acid, people with kidney stone problems can drink as much red rooibos tea as they please. 2. Rooibos can help your skin stay looking youthful and young. Rooibos contains alpha-hydroxy acid and zinc. This combination relieves acne, pimples, sunburns or related skin conditions. Alpha-hydroxy acid is not found in many natural sources. Therefore, drink up on the tea! 3. Rooibos can treat allergies. Individuals with allergic reactions like eczema, hay fever, and allergy-related bronchitis should drink rooibos tea. The drink has plenty of anti-inflammatory qualities due to its phenolic content. 4. Rooibos may treat muscle spasms. Rooibos is rich in constituents that ease severe stomach cramps and abdominal pains. Maintaining activation of the potassium channels as well as not deactivating the calcium channels can reduce the presence of hyperactivity in the gastrointestinal tract, preventing diarrhea and other intestinal issues. 5. Rooibos contains rare nutrients. Rooibos tea contains rare nutrients like quercetin and bioflavonoids that help in maintaining excellent blood circulation and hinder hemorrhaging. 6. Rooibos may help individuals with type 2 diabetes. One of the constituents found in rooibos called aspalathin can contribute to balance blood sugar levels, improve insulin resistance, improve the glucose absorption by the muscles, and boost insulin secretion from the pancreas. 7. Rooibos may help benefit the heart. Quercetin is anti-inflammatory, which reduces blood pressure, and it also destroys free radicals like other antioxidants. It promotes an increase in high-density lipoprotein cholesterol (good cholesterol) and inhibits the low-density lipoprotein cholesterol (bad cholesterol) from binding to the walls of arteries and blood vessels. Khan, A. U., & Gilani, A. H. (2006). Selective bronchodilatory effect of Rooibos tea (Aspalathus linearis) and its flavonoid, chrysoeriol. European journal of nutrition, 45(8), 463. Hertog, M. G., Feskens, E. J., Kromhout, D., Hollman, P. C. H., & Katan, M. B. (1993). Dietary antioxidant flavonoids and risk of coronary heart disease: the Zutphen Elderly Study. The Lancet, 342(8878), 1007-1011. Kawano, A., Nakamura, H., Hata, S. I., Minakawa, M., Miura, Y., & Yagasaki, K. (2009). Hypoglycemic effect of aspalathin, a rooibos tea component from Aspalathus linearis, in type 2 diabetic model db/db mice. Phytomedicine, 16(5), 437-443. Van Scott, E. J., & Ruey, J. Y. (1980). U.S. Patent No. 4,234,599. Washington, DC: U.S. Patent and Trademark Office. Gilani, A. H., Khan, A. U., Ghayur, M. N., Ali, S. F., & Herzig, J. W. (2006). Antispasmodic Effects of Rooibos Tea (Aspalathus linearis) is Mediated Predominantly through K+‐Channel Activation. Basic & clinical pharmacology & toxicology, 99(5), 365-373. Tiedtke, J., & Marks, O. (2002). Rooibos-The new" white tea" for hair and skin care. Euro Cosmetics, 10(6), 16-19.